Maybe these things are falling off the shelf elsewhere in the world but I’ve had great trouble locating them in the UK in reasonable batch numbers. 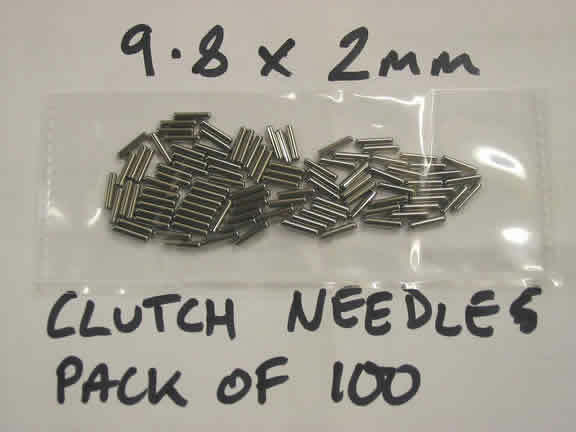 There are 50 loose needles used in each clutch basket bearing on most of the 250 engines & late model 175 MSDS engines which also use the bigger 250 clutch. Retained by thick grease on initial assembly this gets dissolved over the miles leaving the needles free to fall out on disassembly – usually a few escape to needle roller land never to be seen again. 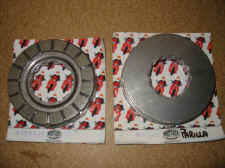 Happily, for the hi cam owner both sizes of clutch plate are available both as plain & friction plates. I’ve only seen them sold as either 5 or 7 piece sets for the small & large clutches used on the 175s & 250s (& 175 MSDS) but I’m told they can be found singly from some retailers. Made by Surflex in Italy. They make replacement clutches for most bikes, modern & classic, Brit & Italian. All you need is the part number. 5 plate set is S1051/C. 7 plate set is S2072. I keep several sets of both in stock for my bikes can supply them at very reasonable prices if required or you can order via any dealer with a Surflex contact.